Lavender-blue glass is a relatively rare colour, sometimes appearing undecorated, as here, but elsewhere carved with relief designs (see Sale 1, lot 36). 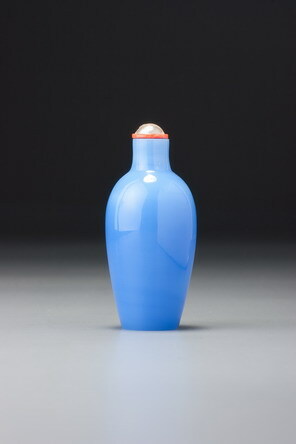 It is a possible candidate for the ‘azure- blue’ (or ‘blue sky after rain’) designation found in early Chinese sources and recorded as a colour produced at the imperial glassworks as early as 1708 by imported Guangzhou glassmakers. The colour also appears in the archives published so far for 1715, 1721, 1725, 1726, 1727, and 1728. Even if this were the colour, however, it need not imply a Kangxi period for this example. Once established, any colour could be repeated at will. As to its provenance, we are faced with the same problem as with so many glass bottles: the imperial glassworks is a likely source, but there is little in the way of corroborating evidence. The shape is a modified meiping (‘prunus- blossom vase’), which was popular at court, a fact that might nudge us towards a palace provenance and, perhaps, a Qianlong date. The other example of this shade of lavender-blue in the collection is more readily datable to the Qianlong period based on the style of the carving (Sale 1, lot 36), which suggests the same would seem a reasonable guess for this one. Formally it is an extremely rare variation on the meiping, lacking the traditional incurving base of the standard form. 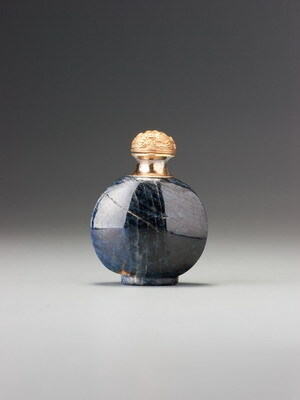 It may even be better related to other standard ceramic forms, but since ceramic and bronze forms were so frequently the inspiration for palace snuff bottles, this would not alter the slight courtly connection noted above. Whatever its source, it is a shape very rarely encountered in the snuff-bottle world, significantly enhancing its appeal. It is likely to have been mould-blown. The paling of the colour towards the neck, another attractive feature, is achieved unevenly, leaving very faint horizontal bands of paler colour where the two merge. The effect is that of light clouds in a summer sky, which offers an enticing association with our ‘blue sky after rain’ designation, but all we can say at present is that among the colours of blue glass known from China, this one seems to have as much claim to the term as any, and more than most.